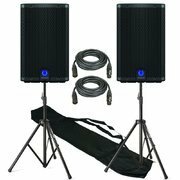 This small but powerful equipment is sure to please with quality sound that can be heard clearly throughout your event! Play your own playlist via bluetooth or auxillery, or choose to use our party playlist. Use this set up for events up to 100 people.